We are proud to announce our first International marketing efforts. 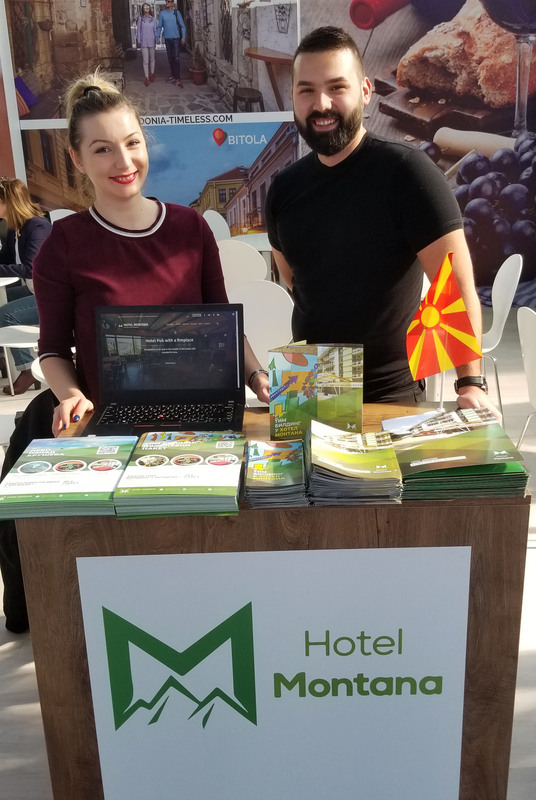 We decided to be present on the Belgrade Tourism Fair 2019 in Serbia. We are part of the Macedonian quarter. We are together with many of our colleagues presenting the potential of Macedonia and Krusevo. This fair lasts from 21.02.2019 until 24.02.2019. Each year it sees thousands visitors looking for places for holidays, fun and business. Hotel Montana decided to show off as a location for business events. We worked on marketing to show many areas of our hotel for business events. Another important part of our offer are our team building services. We also take care to promote our partner agents who help us in facilitating and creating high quality team building services. Why Belgrade Tourism Fair 2019? We see Serbia as a destination where we can sell conference travel and team building services. Since the highway to Macedonia is almost complete travel times will be a lot shorter. This will make our country far more attractive for business travel. This is even more important for companies from Belgrade. We plan on keeping constant presence on the tourism fair in Belgrade. We plan to create a solid image for our Hotel Montana in Serbia. How do we present ourselves? Our presence is enabled by the Agency for the promotion of tourism in Macedonia. We booked a spot and are a part of the Macedonian stand. There are many other tourism agencies and hotels from Macedonia. We engaged in direct contacts with potential partners. Our main goal is to attract tour operators to include Krusevo. Most of our efforts were towards the promotion of the unique attractions in our little town. This is the first time the municipality of Krusevo engaged in International marketing efforts too. We are happy to have learned a lot. We learned about the Serbian tourists and what they expect from us.